If you need to run some cron jobs on server, check out the ruby gem whenever. It lets you write cron jobs in ruby way. You can do lots of useful thing using whenever, create database dumps/backups, run scripts/commands on reboot etc. 1. Add whenever to your Gemfile and run bundle command. If you use capistrano for deployment, you should add this to config/deploy.rb. Next time, you push the code to the server, it will create the required cron jobs on the server. Make sure, it’s working as expected and let me know (via comments) if you’ve any issue. OpenShift is a Platform as a Service (PaaS) from RedHat. It’s great for deploying web applications as you can setup/scale/manage apps quickly without any hassle, just like Heroku, but the OpenShift platform is available as a free and open source software, so you’re not locked in (you can install OpenShift on your server and create your own private PaaS if you want). Previously, I’ve already written on various deployment options available for a rails application, also on deploying rails app to vps. 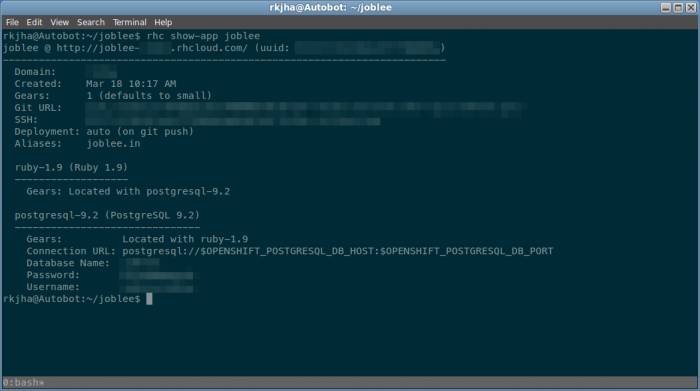 In this article, I’ll guide you in deploying your Rails application to OpenShift. First of all, Create a free Account. You get 3 small gears (resource container/unit : one small gear is equivalent to 512 MB RAM and 1GB storage) for free. If you need more, you can upgrade to premium plans. Note : If you use rbenv for managing ruby then you also need to run `rbenv rehash`. And follow the instructions. Once the setup is completed, you can easily create/manage your apps using this client utility (rhc). Run this command from the parent directory of your project (~/parent_directory/project) or it will create a directory inside your app. Note : joblee is the name of the Rails app we’re going to deploy. So, replace it with the name of your app. And I assume you’re using Postgresql for database. Once the openshift is setup, move to your project directory and setup git push deployment for your app. Now, merge the remote repo with your development repo. Then, you need to manually fix conflict in config.ru. Keep the default content of config.ru file. git commit -am "fixed merge and now getting ready for deployment"
That’s all :-). Now, your app should be live at : http://your_app_name-domain.rhcloud.com. I had to run few other commands on server due to some gems/assets related problems. But you can add it to openshift deployment hooks like this example rails app, so you won’t have to manually execute it every time you deploy the app. First, add openshift app url (app-domain.rhcloud.com) as a cname record for www and the IP Address 174.129.25.170 (using the free redirection service) for root record. So, it will redirect root domain to www version. Now, register that domain with rhc server. Ajenti – Awesome and easy server administration frontend! Ajenti is a server admin panel program for web administrators. It’s available for Debian (or its derivatives such as Ubuntu), Arch, CentOS, FreeBSD, Gentoo etc. Most of the server administrators prefer command line, that’s usually fast and efficient for setup and deployment, but for monitoring servers, it would be lot easier to use an admin panel like Ajenti, especially if you’re not very good at commands. 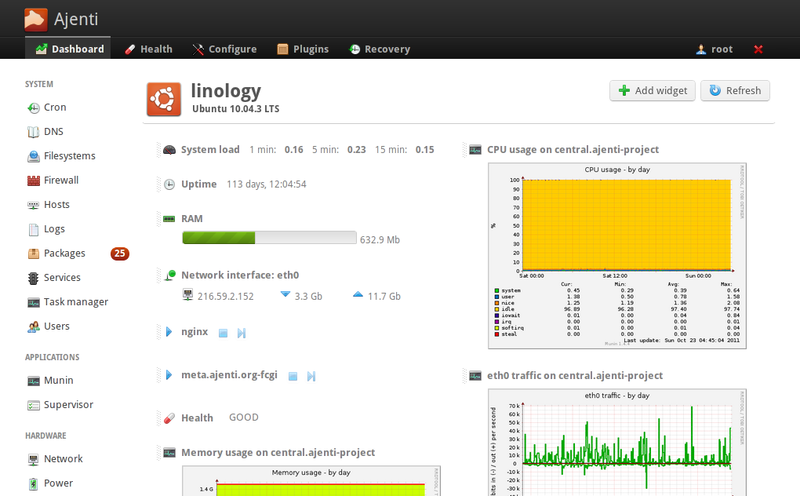 Ajenti provides a very nice and easy to use Dashboard for monitoring and controlling servers, you can check resource usages (RAM, CPU graphs and reports), configure firewall, DNS, check logs, install/update packages, analyse network status, create/remove cron jobs, recovery/backup settings and a lot more things (just install the plugins you want to use). It basically provides an elegant GUI for managing servers, in a very easy way. You would probably feel like – using a desktop environment, specifically designed for server administration. It’s a step by step guide for setting up wordpress on a vanila server (e.g Digital Ocean, don’t know about it? 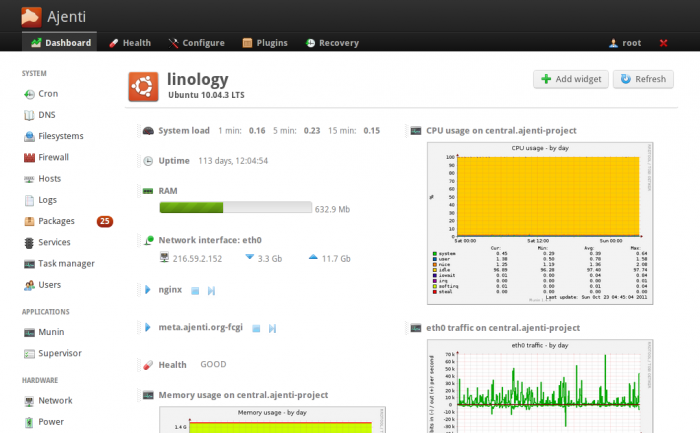 then read Digital Ocean VPS Review) running Ubuntu 12.04 LTS (latest LTS release, recommended for server). With, most of the VPS providers, you can deploy GNU/Linux distribution from their control panel itself, after that, everything will done over the ssh connection. ssh into the server and create a user (as it’s not a good idea to use root account). Now, logout from the current session and login again with the user newly created above. In this tutorial I’ll be using nano editor (a light-weight command line editor) So, if it’s not already installed – then install it using sudo apt-get install nano. If you selected nginx instead of Apache, here is a sample configuration for nginx/wordpress blog. During installation process, you will be asked to provide password for MySQL root account. Download the latest version of wordpress and extract its content. For simplicity, you can rename the wordpress directory to something like – your domain name e.g example.com. Now, you can manually edit the wp-config.php file or go through the automated installation process (just visit the URL, I assume you have setup DNS correctly, or use IP address instead). Then add the database details and random strings for session tokens etc and save the file (Ctrl+x, y). Now, rename the file. That’s set, you’ve successfully installed wordpress, visit the URL/IP_ADDRESS and create the admin user. If you’re moving your old wordpress blog to a new server, then you also need to copy wp-contents directory (from the old one to new server, it’s the directory – that holds your images, themes and plugins). Besides that you will also have to export/import database contents. Use your server control panel or a tool like PHPMyAdmin (which is usually installed on all shared hosting providers) to export your database contents in *.sql format. Note : If you have any problem during installation, then leave a comment here, we’ll try to figure it out! VNC Server : The Program Running on the computer which will allow the other computer to share/control the desktop. VNC Protocol(RFB) : simple communication protocol which transfer the events(mouse and keyboard events) between the client and server. #1 : Vino : it is the default vnc server of Ubuntu 10.10. You can start using it on ubuntu by going to System->Preferences->Remote Desktop. Then configure it according to your need. Use strong password for security reasons. #2 : x11vnc : it is independent of Linux Desktop (GNOME/KDE) and specially useful for xubuntu users. Using x11vnc requires some command line skills so, it isn’t much easy for beginner linux users. Other vnc servers are tightvncserver,krfb etc. Teamviewer is the best vnc server for beginner users, it is available for Linux based OS,Windows and Mac. it is free for personal uses. 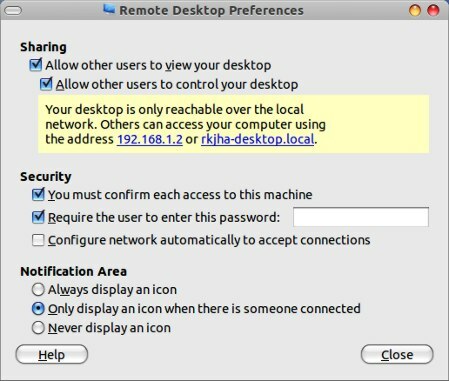 The desktop sharing can be easily done using teamviewer. First it creates a session then you can send the unique session id/password(generated by teamviewer) to other client end ; all with a simple graphical interface(No commands knowledge is required). See More Tutorials on installing TeamViewer on Ubuntu 10.10 if you want to try teamviewer.